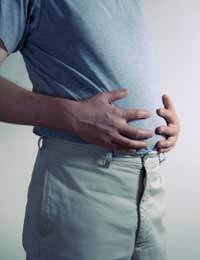 Stomach distress happens to virtually everyone at some point and symptoms can range from mild to severe. Poor digestion side effects from other medications, viruses and other pathogens can cause gastrointestinal distress. Stress can also contribute, leaving you with a sensitive and painful gut. A well-stocked medicine cabinet, however, can ease your discomfort and get your digestive system back to optimum working order. Prevention is the ideal approach but if you are experiencing diarrhoea or constipation, don't despair because there are several ways to effectively treat the symptoms. Constipation is the passage of hard and often painful stools. No bowel movements for several days can also constitute constipation, particularly if your movements are usually more regular. You may feel bloated and experience stomach cramps and pains. Lack of fluids and fibre in the diet can lead to constipation and the best treatment is usually to prevent it from happening in the first place. If, however, you do experience the very occasional bit of constipation, you can use fibre products such as Metamucil. It's considered gentle and non-habit forming. Keep in mind that you always have to increase fluids when you increase fibre, or you may feel even more constipated. You can also use bulking agents such as bran to treat constipation. Laxatives can be used but they should usually be the last resort and should not be used for extended periods of time, as they can cause bowel dependence. Stimulant laxatives will cause muscles in your bowels to contract; an example of a stimulant laxative is senna. Other laxatives increase the water content of stools and these are known as osmotic laxatives. It's important to follow instructions very carefully when using a laxative because taking too much can cause a great deal of discomfort and cramping. As an additional note, regular activity can help you to prevent and treat constipation so a brisk walk may be helpful. Diarrhoea has numerous causes, ranging from viruses and bacteria to food intolerances, stress, and alcohol. It's essentially an abnormal fluid balance and results in frequent, watery stools, often accompanied by stomach cramping, gas and pain. It's important that you drink plenty of fluids and that you replace the lost nutrients. Some people find that bland foods are best and are less likely to irritate a temperamental stomach. Over-the-counter remedies for diarrhoea include treatments such as Imodium, which are considered effective and gentle for relieving symptoms. Anti-diarrhoeal agents generally aid in preventing irregular gastrointestinal contractions and if your diarrhoea is particularly severe, a medication can make an enormous difference in treatment. Some also help to replace the electrolytes that are lost through diarrhoea. If you are experiencing persistent constipation or diarrhoea, it's important to see your doctor for examination. The odd episode of constipation or diarrhoea is usually normal and is most likely due to dietary or stress related factors but if symptoms persist, then it's wise to have your doctor check to ensure it's not something more serious. In the meantime, maintain a healthy lifestyle to prevent gastrointestinal problems and when they do strike, make sure your medicine cabinet has the basics you need to ease your discomfort and get your digestive system back to normal functioning.